Unrelenting rains continue to wreak havoc in 12 districts around the country, leaving 1,024 persons displaced, over 22,000 persons affected and six dead. The Ratnapura, Galle, Matara, Kegalle, Kalutara, Anuradhapura, Mullaitivu, Trincomalee, Badulla, Nuwara Eliya and Matale districts were affected by the South-Western monsoonal rains. The Meteorological Department issuing a report yesterday stated, “Showers or thundershowers will continue to occur in the Western, Southern, Sabaragamuwa, Central and North-Western provinces”. Heavy rain fall of about 150 mm is expected in the Sabaragamuwa and Western Provinces and in the Galle and Matara districts. Rain fall, above 100 mm is expected particularly in the Central, North-western and Uva provinces and in the Hambantota district. There may be temporary localized strong winds during thundershowers. It further said that the sea area extending from Kankasanturai to Potuvil via Puttalam, Colombo, Galle and Hambantota can be rough at times as the wind speed can increase up to 60 kmph at times. The deep sea area extending from Puttalam to Potuvil via Colombo and Galle can be rough at times as the wind speed can increase up to 60-70 kmph at times. Very strong gusty winds (up to 70-80 kmph) and rough seas are expected during thundershowers. Fishing communities have been requested to be vigilant in this regard. The water levels in four of the main river basins in the country have been increasing as a result of the rains. Disaster Management Centre Assistant Director and Media Spokesman K.A.D.P.K. Koddippili said the water levels of the four main rivers Kelani, Kalu, Gin and Nilwala have increased causing floods in several areas while water levels in the Attanagalu Oya and Ma Oya have reached flood levels. He said that the flood water level of the Kelani River in Deraniyagala, Kithulgala and Holombuwa was however dropping while water levels were increasing to minor flood levels from Avissawella to Nagalangamuwa downstream. 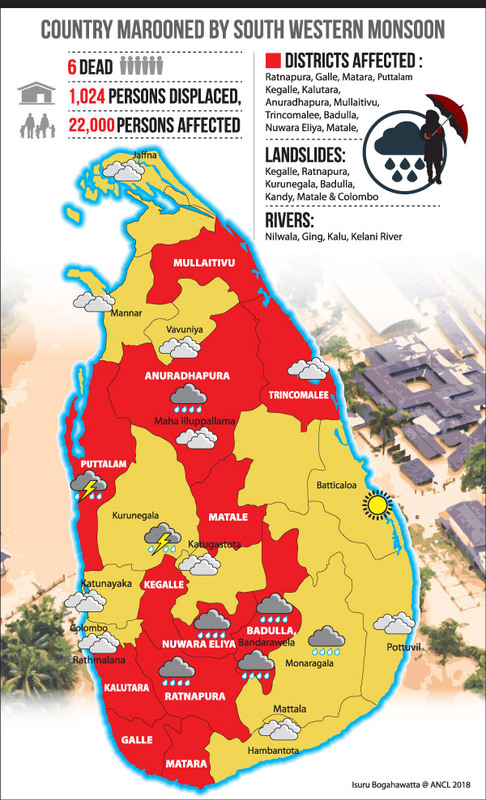 Colombo, Kelaniya, Kolonnawa, Biyagama, Kaduwela, Hanwella, Dompe, Ruwanwella, Dehiovita and Deraniyagala areas could be affected by the flooding of the Kelani river. Koddippili further noted that water levels in the Nilwala Ganga was receding in the Uurawa and Pitabaddara areas, though in areas such as Akuressa and Panadugama it was increasing. Matara, Kadawatha Satara, Thihagoda, Malimbada, Kamburupitiya, Athuraliya, Akuressa and Pitabeddara could be affected by the flood. “Although water levels in the Gin Ganga in the Thawalama area was dropping, heavy floods prevail in the area,” said Koddippili. Neluwa and Thawalama have been one of the worst affected areas in the Galle district. On the border of the Thawalama Divisional Secretariat, in the Habarakada West Grama Niladhari division, a man who had gone fishing had been swept away by the floods. His body was found by a Naval team operating in the area, said Thawalama Divisional Secretariat, Dhammika S. Weerakoon. With the flooding of Gin Ganga, the Hiniduma -Mahabodiwatte area had been inundated with 5 feet of water. The Thawalama-Neluwa road, Mawanana area, Neluwa-Batuwangala main road, Udugama-Katagoda junction, Neluwa-Duli Ella Road.are inundated and, access to these areas have been shut off. Most schools in the area were closed yesterday. Galle District Disaster Management Centre Director Col. Dampath Ratnayake said seven teams including Army, Navy and relief teams have been deployed in the district to rescue the affected . Bad weather conditions during the last two days have resulted in the death of one with 44 families, 185 individuals being affected, said Galle Acting District Secretary Pradeep Ratnayake. It has also been reported that two houses have been completely destroyed whilst 72 have been partially destroyed. These statistics do not include Neluwa and Thawalama, added the acting District Secretary. CEB Galle office sources said power to Neluwa and Thawalama had been disrupted due to the falling of trees in the area. It is reported that CEB officers were trying their best to get through, but their progress was hindered due to fallen trees in the area. Once the trees are cleared, they will be able to get through to restore power, a CEB official said. Water levels of the Kalu Ganga in the Ratnapura area were also rising. Kodippilli said the water levels could go up further due to the heavy rainfall at the upper reaches of the river. Kalutara, Dodamgoda, Millaniya, Madurawala, Horana, Palindanuwara, Bulathsinhala, Ingiriya, Kiriella, Kuruvita, Elapatha and Ratnapura could be affected by the flood. Water levels in the Attanagalu Oya could go up further. Negombo, Ja-ela, Katana, Minuwangoda, Gampaha and Attanagalla could be affected by the floods. He added that the floods caused by the overflow of Ma Oya in Giriulla was receding slightly.But the water levels downstream was increasing and Pannala and Divulapitiya could be affected by the floods. With the heavy rainfall experienced in the western slope in the Central hills, two sluice gates of the Kotmale reservoir have opened automatically. Kotmale hydro power plant officials stated that the rest of the sluice gates would be opened if the rain continued. Engineers of the power plant warned the people residing by the Kotmale Oya to be vigilant of high volumes of water in the Oya if the rain continued. The volumes of water in the Devon waterfall and St Clair waterfall have also increased. Norwood Police said that lands and houses in Norwood have been inundated due to the flooding of the Keselgamuwa Oya and the residents have been evacuated to safer places. Some of the roads in Hatton too have gone under water. Meanwhile, seven spill gates in the Polgolla reservoir too have been opened. In addition to floods, the National Building Research Organization (NBRO) issued a landslide warning for the Kegalle, Ratnapura, Kurunegala, Badulla, Kandy, Matale and Colombo districts yesterday. Accordingly, the Rambukkana, and Warakapola Divisional Secretariats were alerted in the Kegalle District while the areas of Balangoda, Imbulpe, Opanayaka, Weligepola, Godakawela were alerted in the Ratapura district. The Haldummulla Divisional Secretariat in the Badulla dirstrict together with the Udapalatha and Ganga-Ihala Korale Divisional Secretariats in the Kandy District were put on alert. 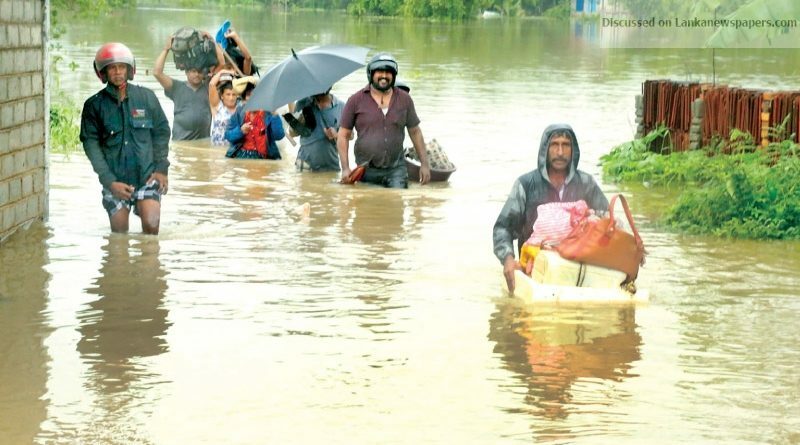 The Matale, Rattota and Ukuwela Divisional Secretariats and the Seethawaka Divisional Secretariat in the Colombo district have also been issued warnings. The NBRO further requested citizens residng in the vicinity slopes, cut slopes and retaining wall failures to be on alert. People have been asked to pay attention to early landslide signs which are; development of cracks on the ground, slanting of trees, electrical posts, fences and telephone posts, cracks in the floors and walls of buildings which are built on slopes and the sudden appearance of springs. The NBRO issued a red notice on Sunday to the Ayagama, Kolonna, Niwitagala, Kalawaana, Kiriella, Palmadulla and Kahawatta Divisional Secretariats in the Ratnapura district and the Agalawatta, Bulathsinhala, Walallawita and Ingiriya areas of the Kalutara district. Red notices were also issued for the Kegalle, Mawanella, Galigamuwa, Yatiyanthota and Aranayaka Divisional Secretariats in the Kegalle district,the Abagamuwa area of the Nuwara Eliya district and Pasbage Korale in the Kandy district. Kodippilli stated that the evacuation processes have been carried out in the areas mentioned above and many families were already evacuated. As rain and landslides impact the country, minor power outages have also been experienced in affected areas. CEB Media Spokesperson Sulakshana Jayawardena said there were many localized power disruptions around the country and that CEB workers were working on repairing minor damages to the power line. In areas such as Kuruwita, Eheliyagoda, Kalawana and Kiriella however, the CEB has intentionally cut off power for safety reasons. These areas had been issued with landslide and flood warnings. Schooling has also been disrupted in the Southern Province with the prevailing weather. Southern Province Education Secretary Y. Wickremasiri said there was a marked decrease in student attendance and he said both the prevailing weather and the spread of influenza in the area, might be the reason for it. Education Minister Akila Viraj Kariyawasam yesterday directed the Principles and Directors of the Education Zones to decide on whether or not to open schools in disaster prone areas considering the prevailing weather condition. The Diaster Mangement Centre (DMC) yesterday evening advised the people living close to the Kelani river banks to evacuate to safer places as the water level was rising to flood level. People living in low lying areas in the Kalutara and Galle districts were also cautioned as soaring water levels in the Kalu and Gin rivers may lead to minor flooding. DMC sources said that 247 boats and 275 small boats (Oru) have been deployed to the affected districts along with the Tri-Forces and the Police. “Thirty welfare centers have already been established with 1,212 distressed citizens currently housed there. The Disaster Management Ministry had allocated Rs. 28.7 million together with an additional Rs.1 million been alocated for each district,” DMC officials said. Meanwhile, Meteorological Department Deputy Director Meril Mendis stated that heavy rains will continue to persist during the next couple of days till around the the first week of June. “The heavy rainfall is a result of the South West Monsoon. Wind speeds around the coastal belt could increase during the following days,” Mendis further said.